From coffee shops to clothing boutiques, pop up stores are *literally* popping up every where. But, what is a pop up store? It’s a temporary shop that could be in business one week and then gone the next. For many of our students, owning a salon or spa is their ultimate career goal. To help students get a glimpse of entrepreneurship, we created the ‘MC Pop Up Salon’. 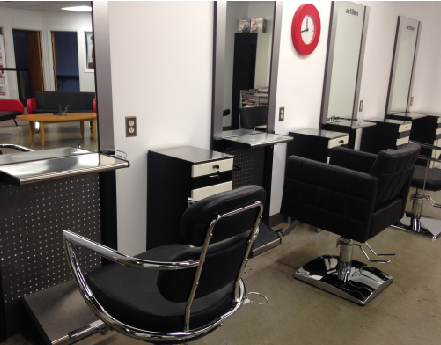 From promoting and creating a dress code to setting prices, groups of MC College Hairstyling students get the chance to own a salon and have total reign over how they want to operate it. Every month, a different team of students get the chance to be their own bosses. 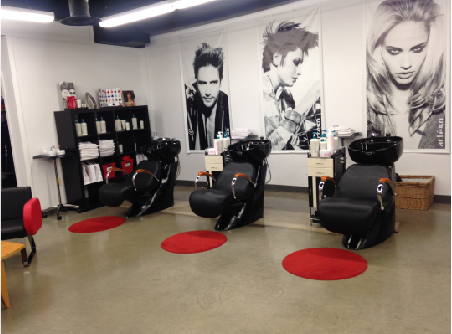 Under the guidance and supervision of MC College’s Education Director, Anna Gemellaro, the student-run Pop Up Salon offers services such as cuts, balayage, hair tattooing, colors and more. Before students get behind the chair and begin their venture, teams of 5 (or less) must submit a business plan which includes a marketing/promotions plan, group members, projected sales, target market, price structure and style/vision. Their business plan is submitted and presented in a format similar to Sharks Tank/Dragons Den (minus Kevin O’leary!). 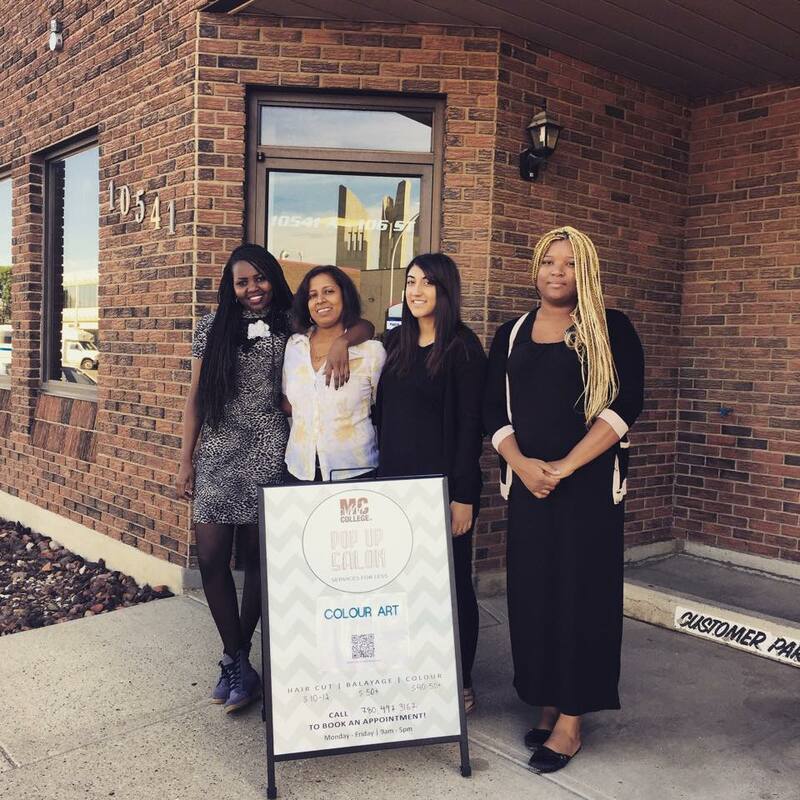 Located in the Heart of Edmonton and separate from the campus’ salon, the Pop Up Salon resembles the fast paced environment of a real salon. Complete with a POS and appointment booking system, retail area and color bar, students are given the tools that enhance their experience as a salon owner. The student teams also get to consult with MC College’s marketing and design department to create a logo and marketing materials. “It was a great opportunity for me and my team…we had lots of fun building our customer service and business skills. I also learned how to work better in a team” says Dona Karunathilake, MC College student and founder of MC Pop Up Salon’s ‘Color Art’. Dona and her team were the first group of students to participate in the MC Pop Up Salon program. Through this program, students learn on-the-job skills in marketing, finance and operations, as well as develop their technical and communication skills. 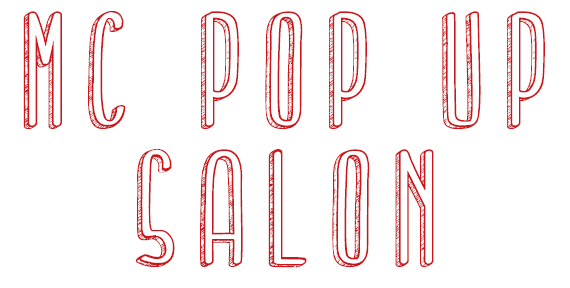 Follow us on social media to be the first to hear about the next Pop Up Salon!